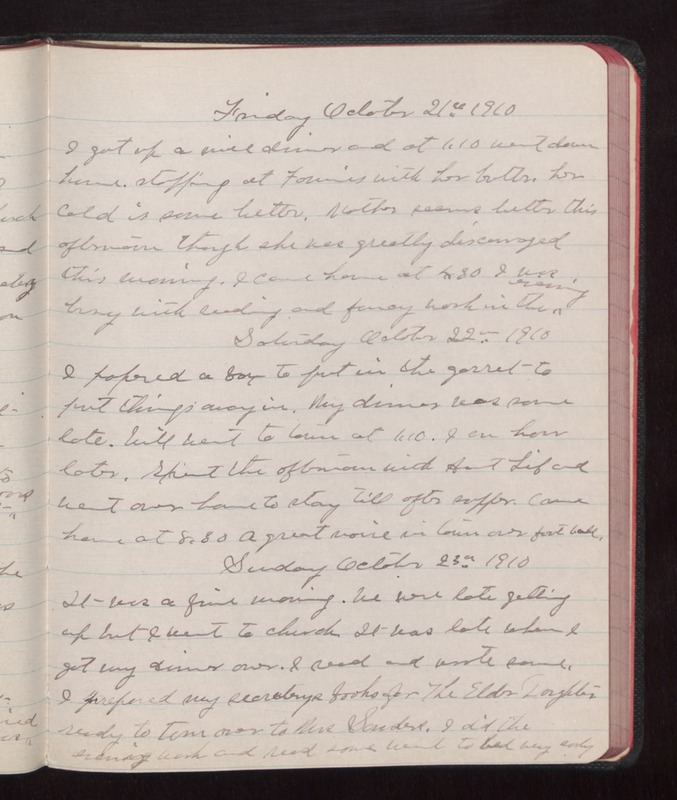 Friday October 21 1910 I got up a nice dinner and at 1.10 went down home. Stopping at Fannies with her butter. Her cold is some better. Mother seems better this afternoon though she was greatly discouraged this morning. I came home at 4.30 I was busy with reading and fancy work in the evening Saturday October 22 1910 I papered a box to put in the garrett to put things away in. My dinner was some late. Will went to town at 1.10. I an hour later. Spent the afternoon with Aunt Lib and went over home to stay till after supper. Came home at 8.30 a great [noise?] in town over football. Sunday October 23 1910 It was a fine morning. We were late getting up but I went to church It was late when I got my dinner over. I read and wrote some. I prepared my secretarys books for The Elder Daughters ready to turn over to Mrs Sanders. I did the evening work and read some Went to bed very early.